South Korean President Park Geun-hye’s administration has been thrown into turmoil by a series of scandals that last week forced her to remove key secretariat officials. Protests have also broken out, with demonstrators demanding she resign or be impeached. According to media polls, the president’s approval rating has fallen to its lowest level since coming to office in February 2013. The woman at the centre of the crisis, Park’s long-time confidante Choi Soon-sil, was detained on Monday after returning from Germany to answer allegations of corruption and exerting inappropriate influence in state affairs. Choi, 60, arrived at the supreme prosecutor’s office in Seoul on Tuesday morning in handcuffs, a surgical mask and a dark coat, escorted by correctional officers. Prosecutors said they are investigating whether Choi used her friendship with the president to gain access to classified documents that enabled her to influence government matters and benefit personally through non-profit foundations. Prosecutors have asked eight banks for documents related to Choi’s financial transactions, South Korea’s Yonhap news agency reported. Park, 64, and Choi have known each other for decades. Park’s father, Park Chung-hee, controlled South Korea for 18 years after seizing power in a military coup in 1961. Park senior was murdered in 1979 by the head of the country’s spy agency, which accused Choi’s father and family of holding undue influence over the dictator. Last Friday, Park ordered 14 of her top secretaries to submit their resignations, although not all were accepted. The reshuffle included the removal of Woo Byung-woo (U Byeong-u), the senior presidential secretary for civil affairs, and An Jong-beom, senior presidential secretary for policy coordination. Both men have faced corruption allegations. An, in particular, has been accused of involvement in the scandal surrounding Choi Soon-sil. Three other secretaries believed to be associated with Choi—Lee Jae-man, Jeong Ho-seong and An Bong-geun—were also removed from their positions. The allegations involving An Jong-beom and Choi Soon-sil emerged as part of an audit into the activities of Woo, who was involved in a bribery case with online gaming company Nexon, and other government figures. At the end of September, Noh Woong-rae (No Ung-rae), a member of the opposition Minjoo Party of Korea (MPK), released transcripts of An Jong-beom directing the Federation of Korean Industries (FKI) on the amount of money they should “donate” to two non-profit corporations, Mir and K-Sports. That these allegations became public is an indication of the intensity of the conflict within the South Korean bourgeoisie. Choi was reportedly behind the creation of Mir and K-Sports, which collected 80 billion won ($72 million) from 53 major companies in just a few months. The foundation of the two organizations—in October 2015 and January 2016, respectively—was approved in just a single day, a process that usually takes weeks. An Jong-beom has been accused of using the FKI to pressure corporations into giving money. Choi has also been accused of being involved in deciding policy matters. Lee Sung-han, the former secretary-general of Mir, told the Hankyoreh newspaper that closed-door meetings over the shutdown of the Kaesong industrial complex in North Korea, for example, were led by Choi. 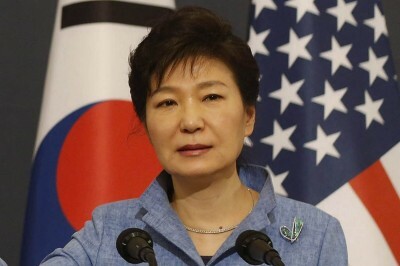 Park admitted in an apology on October 25 that Choi had assisted in writing her speeches. Choi, who has held no official position in government, is the daughter of Park’s one-time mentor Choi Tae-min, who headed a cult known as the Church of Eternal Life. The elder Choi died in 1994. On Saturday, as many as 20,000 people in Seoul gathered to call for the president’s resignation, with similar protests in cities like Busan. Significantly, participants included high school and university students. Foreign workers also took part. The official opposition parties used the protests as platforms to advance themselves as alternative administrations. “Park has lost her authority as president and showed she doesn’t have the basic qualities to govern a country,” Jae-myung Lee, from the Minjoo party and the mayor of the city of Seongnam, told protesters from a stage on Saturday. Corruption scandals in South Korea are typically used to settle political scores, as bribery and influence peddling are commonplace. Park is not just unpopular with the population; she faces concerted opposition within her own Saenuri Party, where a strong anti-Park faction exists. About 50 Saenuri legislators demanded the party leadership, comprised of mostly pro-Park figures, give up their positions at the head of the party. Rep. Hwang Yeong-cheol stated: “The current party leadership is responsible for failing to properly stop Choi’s involvement in state affairs.” They are calling for a “neutral” leadership, with more positions for the anti-Park lawmakers. A strong anti-Park faction solidified in the 2000s around Lee Myung-bak, who touted his experience as Hyundai Engineering’s CEO to win support from big business. However, many of Park’s backers had closer links to her father’s military dictatorship. Bitter infighting took place before Lee defeated Park in the conservative party’s primary, and then became president in 2008. Four years later, Park secured the nomination. The investigation into Park’s secretaries and confidantes has nothing to do with fighting corruption. It is an intensification of the struggle over who will be elected president in 2017, as the incumbent is limited to one, five-year term. Ban Ki-moon, the UN secretary-general, is believed to be favored by the pro-Park faction. Kim Mu-seong of the anti-Park faction is also considered a potential candidate. Facing deteriorating economic conditions globally, the South Korean elite has launched an austerity offensive against the working class. The economy last year grew by only 2.6 percent, and nearly half of that came from the production of unsold goods. Unemployment is growing, particularly among youth. Thousands of workers are losing their jobs in the shipping and shipbuilding industries. In ruling circles, Park Geun-hye is increasingly under fire for not fully pushing through the “labor reform” demanded by big business. These measures are aimed at creating a low-paid, casual workforce, furthering the attack on lifelong employment begun under President Kim Dae-jung following the 1997-1998 Asian financial crisis.